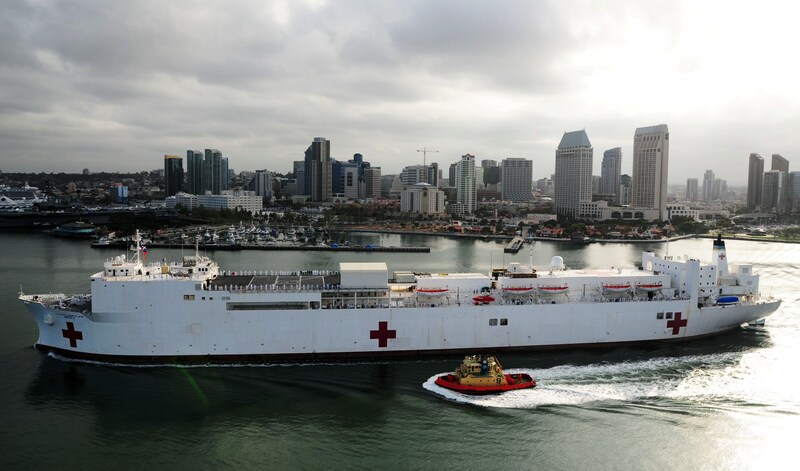 With the “global force for good” in mind, some 400 military service members, many of them trained and skilled in the medical and health professions, boarded the hospital ship Mercy at San Diego Naval Base, Calif, on the morning of May 1 for a mission to Southeast Asia. Joining them that day were scores of civilians, volunteers of all ages from universities, nongovernmental organizations and charities who embarked on the ship for “Pacific Partnership 2012,” the seventh iteration of the U.S. Pacific Fleet’s humanitarian and civic action program that grew from the widespread disaster of the 2004 tsunami that struck South Asia. The atmosphere on the pier was one of excitement, as if a cruise ship was heading out to sea. 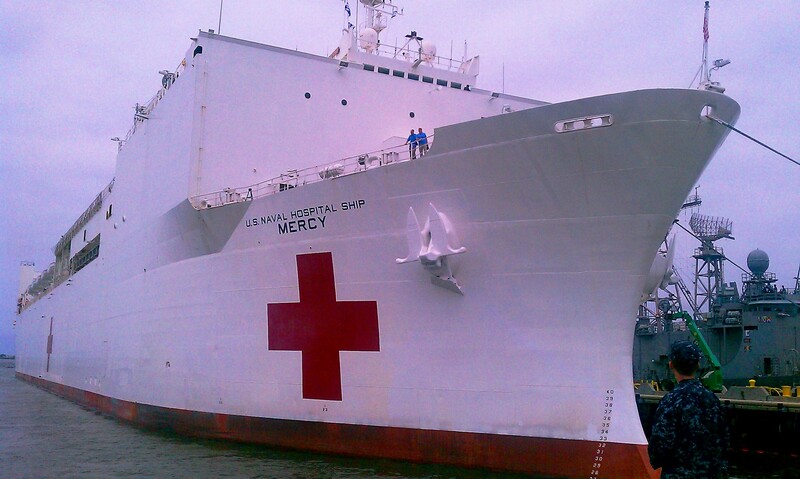 In the coming week or two, nearly 1,000 will board the ship for missions in Indonesia, one of four countries Mercy will visit on this deployment, along with the Philippines, Vietnam and Cambodia. Sailors manned the rails for the departure through San Diego Bay, a string of white uniforms interrupted by an occasional Air Force blue dress uniform or Army beret. But just as Mercy was preparing to leave her berth, and crews readied to lift the brow and toss the lines, trouble came with a faulty valve in the forward propulsion section. The crowd waited on the pier. It wasn’t long before the ship’s radar went still, and two super tugs waiting to nudge the former tanker-turned-hospital ship from the pier veered away and headed back to their berth nearby. It would be two days before Mercy, with repairs done, would get underway. Life on the 894-foot-long ship will have a different feel than her previous sea tour aboard the carrier Abraham Lincoln. “It’s smaller but it’s more comfortable,” she said of the berthing spaces and lounges. “They’ve got a Fit Boss, and they even have a Fun Boss.” “It’s kind of like a cruise ship atmosphere,” she added. “You can go see things that you’ve never seen before.” There’s even a nutritionist aboard, she said. Actually, there may even be more than one. Deploying and joining her over the four months will be a wide range of health, medical, dental and even veterinarian experts with the Military Treatment Facility, along with engineers and scores of civilian volunteers, many who will go ashore for civic, humanitarian and disaster relief missions and training. Others will treat patients aboard the ship, which has up to 1,000 beds, vast medical and patient spaces including surgery, radiology and optometry lab. The ship produces its own water, even oxygen, and can hold up to 5,000 units of blood. The $20 million humanitarian mission will start with Indonesia at the end of May, then onto the other countries for missions lasting two weeks each before the ship returns, probably sometime in September. The mission is about building relationships as much as mending broken bones, fixing teeth and teaching local providers and residents about good health, said Rear Adm. C. Forrest Faison III, who commands Navy Medicine West in San Diego. “We learned that from our experience in Indonesia,” after the 2004 earthquake and tsunami. Nearly two dozen nongovernmental organizations, from Project Handclasp and World Vets to the University of California-San Diego Pre-Dental Society, will participate. “It’s an opportunity to serve our country in ways others can’t,” said retired Army Lt. Col. Mike Hughes, a physician’s assistant and LDS Charities volunteer who joined his wife Shari, a nurse and veteran of “PP 2010.” This larger presence of volunteers, many who will go ashore to work with military teams and train with local first-responders and NGOs, is noticeable on the ship, crewed by 70 civilian-mariners. “Our people brought a spirit to the ship,” said Dr. Irv Silverstein, the Dental Society’s director and advisor and veteran of previous Pacific Partnerships. “At first, there was a lot of skepticism. By having the civilian engagement concept, there’s less of a feeling that it was a military mission.” Cultural exchanges and training help as well. “It’s not us telling them how to do things,” he said. You can track PP ’12’s own blog here.